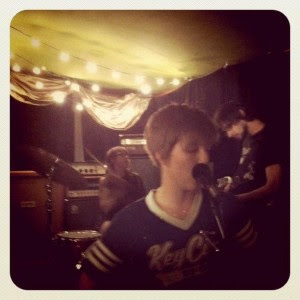 Troubled Sleep is an indie rock, four person outfit that comes to us from Brooklyn. They play a catchy style of female fronted rock featuring dual vocals and inventive guitar. The production here is a bit muffled; I think with some brightening up these songs would shine a lot more. There are times when the drum sound is not as clear as I would like and the vocals get a bit buried. Despite my production qualms, Troubled Sleep throws down 4 songs that are pretty well engineered. "I am the Ostrich" dangles some guitar notes in front of us before kicking off into a wonderful upbeat verse. The dual vocals add a nice extra touch. The drumming stays pretty tame, and this may be my one complaint about the band. There's seems to be some empty space where some more interesting percussion could be happening. A palm muted build up starts off the second track "Spontaneous Human Combustion Should Happen More Often". It unexplosively falls into the verse and you don't really get the pay off until about 1:20 in, when the song really opens up to some big chords accented with back and forth vocals. The standout track here is "Cold Hands", which recently appeared on the Dialogues compilation. The verse has an extremely catchy hook that breaks up into a subdued chorus. After two rounds, the song builds into a group vocal chant driving the band on full force to finish off strong. Troubled Sleep is by no means jaw dropping, but there is a huge potential here for a band that obviously knows how to put together some good tunes.